Watch how Dr. Energy Saver can improve your home's efficiency with spray foam insulation. When it comes to home insulation, it's hard to beat the quality of spray foam. Spray foam insulation outperforms other insulation materials in terms of R-value, resistance to mold and moisture damage, durability, air sealing, and versatility. There are two types of two-part spray foam insulation -- open-cell and closed-cell. Each has different features, advantages, and disadvantages. Your local Dr. Energy Saver will help you determine the best foam for your needs. Open cell foam is spongy and light, resisting air leakage but allowing moisture vapor to pass through. Open-cell foam is a very light material that is designed to break or pop as the foam expands but before it sets, allowing pieces to be removed. Open cell foam is low density and can fill larger areas with less material, and it has a R-value of 3.5-4 per inch. On a cost-per-R basis, open-cell is the more economical spray foam choice. 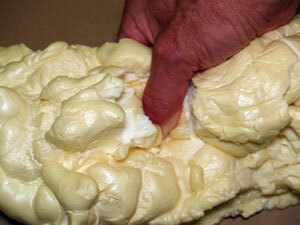 However, it is not as effective as closed-cell spray foam. Open-cell is a more environmentally friendly option as well, which is a benefit for homeowners concerned about their environmental impact. Here are the advantages and disadvantages of open cell foam. Closed-cell foam cures as a dense, hard material that seals off the space from both moisture and air. When properly installed, SPF creates a highly insulated building assembly that's also free of energy-wasting air leaks. 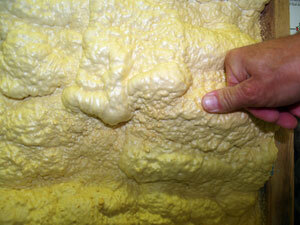 Closed-cell is about 3-4 times as dense as open-cell foam, and it provides an R-value of 6-7 per inch. Here are the key advantages and disadvantages of closed-cell foam. If you're interested in spray foam insulation for your home, contact your local Dr. Energy Saver dealer today. We will help you find the right materials for your home's needs and give you a quality installation. Call today for an estimate!